From an offensive standpoint the turtle position frustrates me. Everyone in my gym is really good at turtling up and making it almost impossible to attack the back or lock in any sort of Darce choke. For a few months I was able to use the crucifix to attack the turtle but since we have a few excellent crucifix players in my gym it’s becoming harder and harder to hit the crucifix. 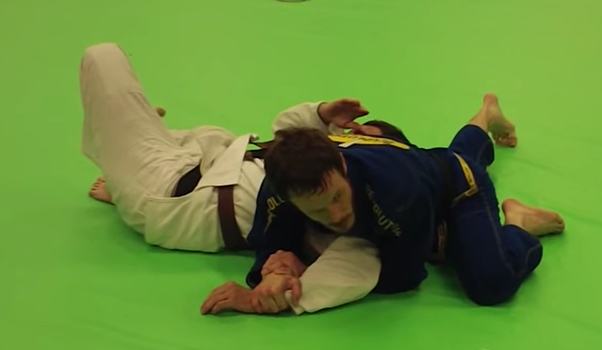 In the video below Andrew Smith of Revolution BJJ shows how you can use a kimura grip to attack the turtle. What I like about this move is that it’s simple and you maintain a solid top position throughout the move. It also can lead directly into a finish or be used to transition to other top positions. A key detail in using this technique is to block your opponent’s head. To do this Smith uses a windshield wipe movement with both legs. Windshield wiping the legs helps bring your body up towards your opponent’s head. Smith then uses another windshield wipe to place his back knee against the head. By placing his knee behind the head Smith is blocking his opponent from rolling to their back. The knee also helps “trip” the opponent’s body when he uses the grip to roll them over. As an added bonus Smith also shows a great non traditional kimura finish. This type of finish is quickly becoming one of my favorite because of the amount of control that I have. By having my entire body of the side of the kimura I am able to trap and pin my opponent’s shoulder down. This is very difficult for your opponent to escape and very easy for you to finish. For more kimura greatness check out Revolution BJJ’s YouTube channel.